Before you want others to respect you, you need to respect yourself first. Without self respect you will manifest such behavior outside of yourself. Self respect is something you build with small everyday choices. It’s a product of what you choose to say yes to and what you choose to say no to. Strong and healthy boundaries as well as habits that keep you healthy and productive are the essentials when you build self respect. And in time self respect will become your default trait. You will construct a lifestyle that induces self respect to your own self and you will radiate this unto others. However, self respect is not just created by adding habits, it is also revealed by removing habits. 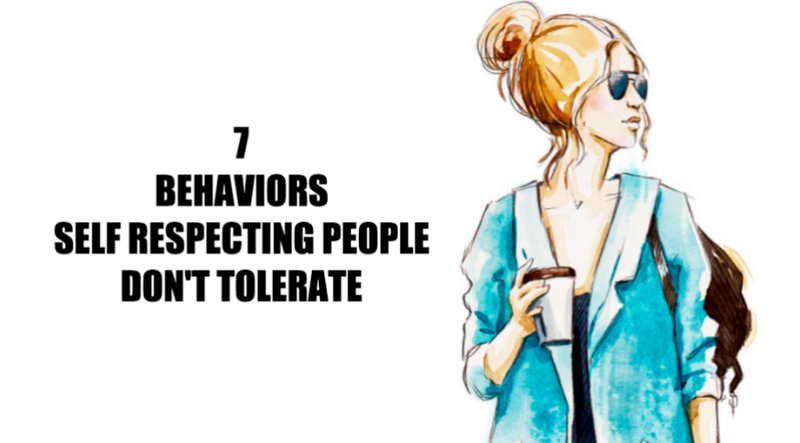 Here are some things self respecting people do not tolerate in any circumstance. Others will give you 1,000 reasons why you shouldn’t follow your heart. You have to rise above the opinions of others, and instead just do what feels right to you. Any self respecting person values their own opinion over others’. Please yourself before others. Having a positive relationship with yourself will make you see endless opportunities and bliss wherever you look. Self respecting people encourage themselves with positive thoughts about their relationships, careers, and goals. They are realistic but encouraging. You can’t grow if you don’t try new things. Self respecting people love to push the boundaries to keep evolving as a person. They try new things, go out into the unknown, they embrace being uncomfortable. They know that’s how you grow and evolve. 4. Trying to fit in. We are all unique in our own way. In order to really thrive in this world, you must carve your own path and learn to trust your own instincts. Self respecting people shine this uniqueness. They don’t try to fit in the world, they make the world want to change. 5. Working at a soul sucking job. Most people work at jobs they hate just to pay the bills. Self respecting people dive deep into their souls to get a sense of their purpose. They know that this thing is one of the things that matters most in their life, so they start from their and build a lifestyle. If you don’t feel well mentally, physically, emotionally or spiritually, examine your life to see where you can make some changes. Self respecting people value their overall health above anything. They do small changes that improve and maintain their health. 7. Not choosing their happiness first. If you don’t do what makes you happy, you won’t have much of a soul left at the end of your life. In order to rise above and set your soul on fire, you must leave behind anything that doesn’t enrich your life. Self respecting people follow the path of joy and happiness.